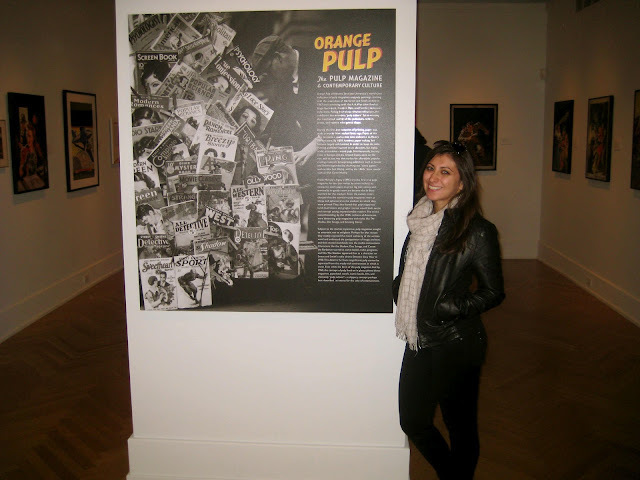 Recently I attended a wonderful pulp art exhibition with my daughter Michelle at Syracuse University's Lubin House in Manhattan. The Palitz Gallery is at 11 East 61st Street, just a block away from my office, and the exhibition ran from February 13 through April 12. I had been meaning to get over there since I heard about the exhibit, and knowing that Syracuse University is the repository of the Street & Smith archives (I'd used their resources in the past, delving into the S&S editorial records for my Joe Maneely biographical research), my expectations were that it would be a great show. I wasn't disappointed. My daughter Michelle is an art history major at NYU and I've accompanied her to nearly every museum she's had to visit during the course of her studies.... The Metropolitan Museum of Art, The Museum of Modern Art, The Frick Collection... you name it, we've been there. Now I had the chance to turn the tables! On the very last day of the exhibition, while meeting for lunch, I informed her that we were going to an art exhibit of "my" choosing, and we strolled across Park Avenue to Lubin House. What follows is a short review and some photos. 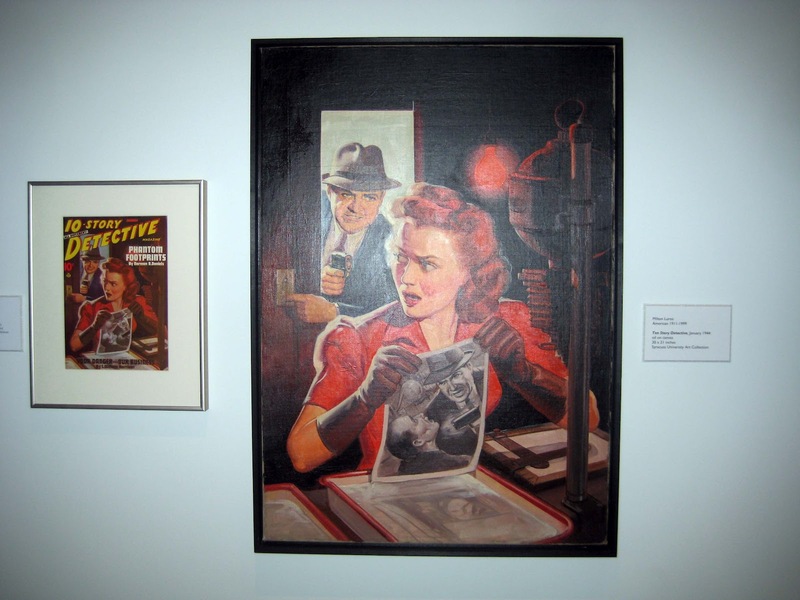 The only link to Martin Goodman and his Red Circle pulps was that the primary artist featured in the exhibit was the celebrated Norman Saunders, one of Goodman's finest pulp and magazine cover artist/painters. 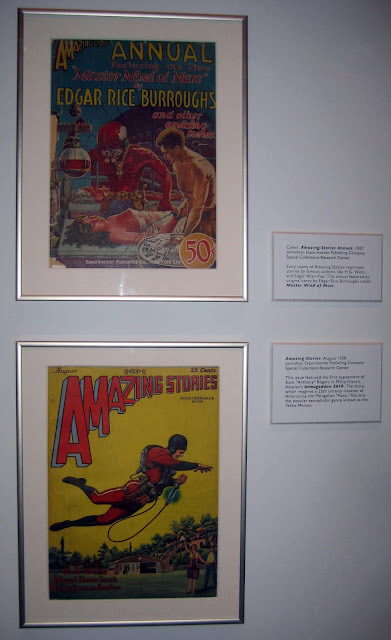 Additionally, the great science fiction pulp pioneer publisher Hugo Gernsback was also discussed and displayed. 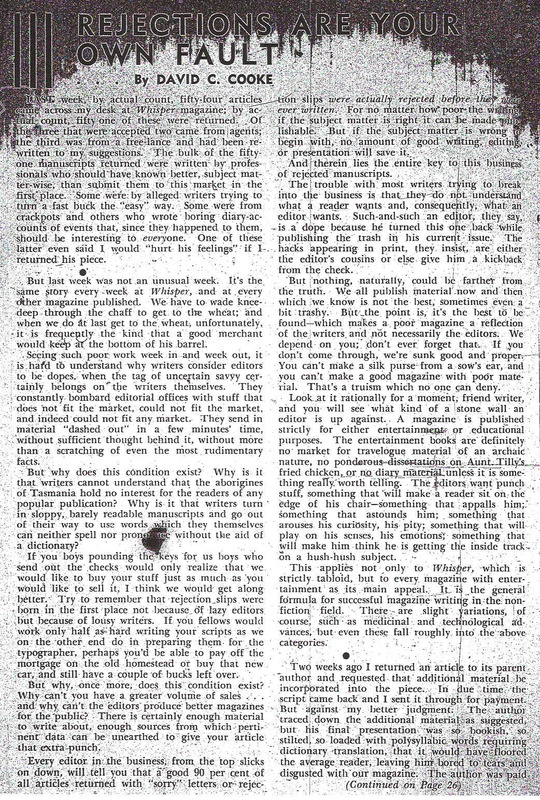 Long held hearsay depicts Martin Goodman starting his career in publishing intersecting in some capacity with Gernsback. 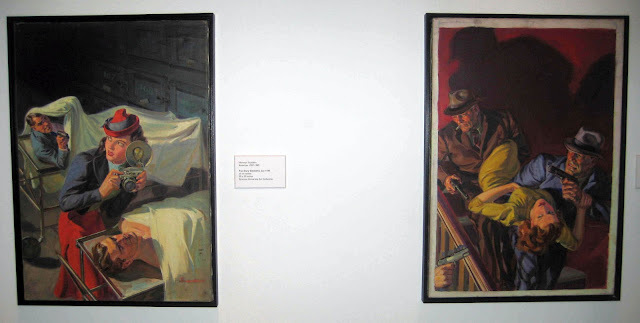 Lastly, Frank R. Paul was also exhibited. Paul was Gernsback's primary cover artist as well as painting covers for Goodman's science fiction pulps (explained below) and his debut comic book cover, Marvel Comics #1. 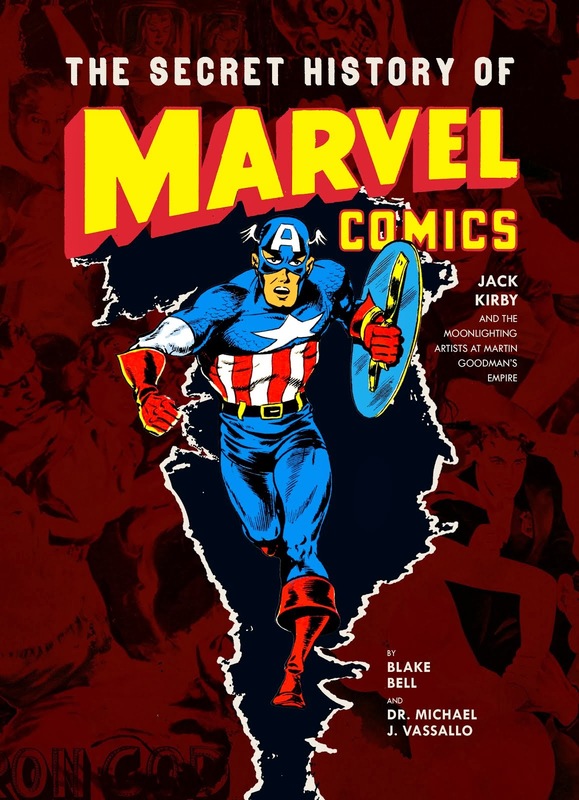 All of this ties in nicely with my upcoming book "The Secret History of Marvel Comics", dealing extensively with Martin Goodman's Red Circle pulp line and the artists who contributed. (Note that the book has been expanded to 300 pages and this is not reflected in the pre-order ad below). 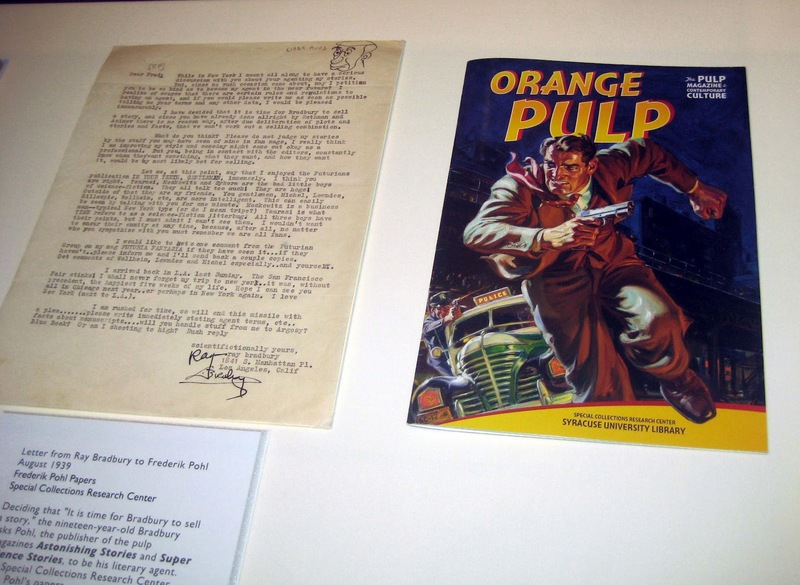 The program booklet above gives a excellent concise background into the history of the pulp in American culture, focusing on Street & Smith, the obvious choice as most of the program consists of holdings in their library archives. Introduction: "Orange Pulp - The Pulp Magazine & Contemporary Culture". 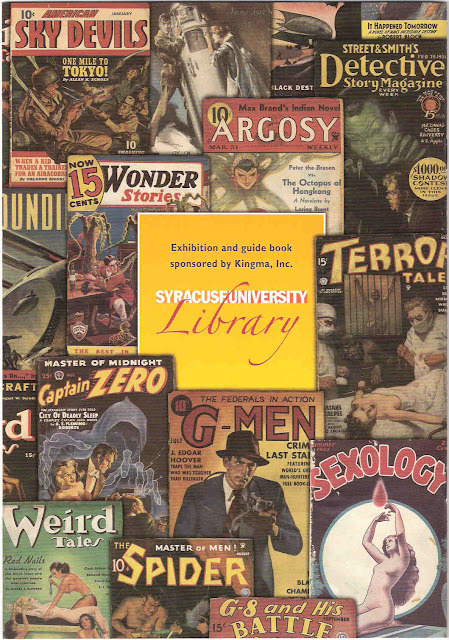 The pulp novel is placed into historical context by Sean Quimby, Director of Special Collections at Syracuse University Library. Street and Smith: A brief history of the company and numerous examples of their pulp and dime novel output, including some some vintage photos of the famous Street and Smith printing presses. Street and Smith also had a comic book line in the 1940's, After the success of their Shadow pulps, Street and Smith debuted their comic book line with The Shadow in 1940 (The debut issue put together by Jack Binder and the Chelser Shop without Shadow creator/author Walter B. Gibson's knowledge. He soon came aboard). 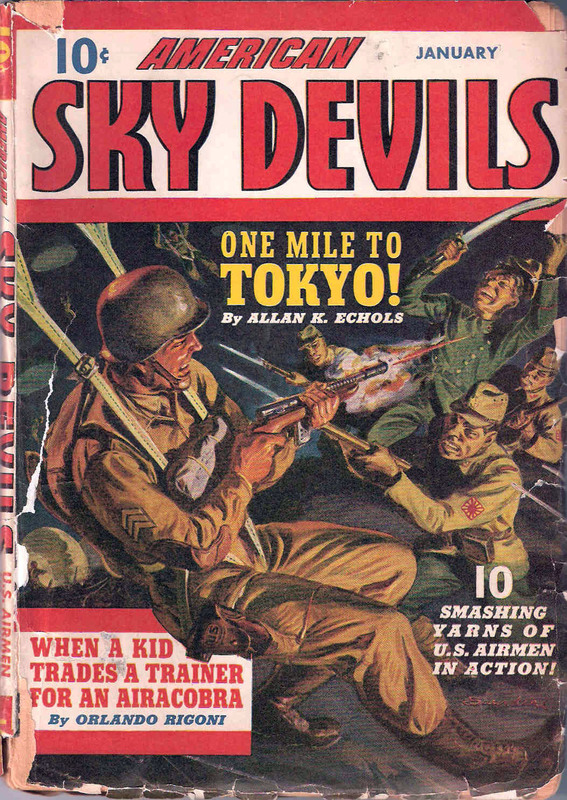 Titles including Doc Savage, Bill Barnes, Blackstone, Super Magician and Red Dragon would follow. Timely/Atlas star artist Joe Maneely made his comic book debut in Street and Smith's Red Dragon #3 (May/48). An exhaustive look at Maneely's Street and Smith career will be seen in my future art biography on the artist. Hugo Gernsback: A brief history of Gernsback and his importance to the history of the science fiction pulp. Below are two cover examples of Gernsback's seminal Amazing Stories pulp, including the debut of Philip Nowlan's Buck Rogers (Aug/28). The artist was Frank R. Paul, the father of science fiction art and Gernsback's #1 artist. Paul's Goodman connection is two-fold. First he painted two covers, Marvel Science Stories Vol 1, #2 (Nov/38) and Dynamic Science Stories Vol 1, #1 (Feb/39) (and a score of interior illustrations in 10 Goodman sci-fi issues). 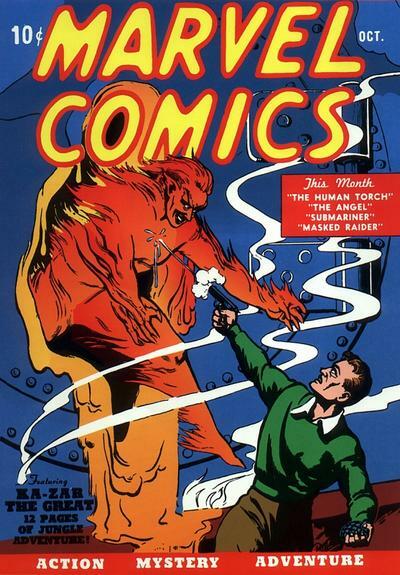 Second, he was the cover artist for the very first Timely comic book, Marvel Comics #1 (Oct/39), featuring the blazing debut of the Human Torch. Once again, the link is that Goodman knew Paul from his earlier Gernsback days and considered him his favorite science fiction cover artist. The Shadow: An overview of Street and Smith's iconic pulp star. (See display in photo below). Pulp Writers: A discussion of everyone from Tenessee Williams, Joseph Conrad, Dashiell Hammet, Isaac Asimov, Robert E. Howard, and H.P. Lovecraft, to William Burroughs (as William Lee) in the classic Ace Double Novel D-15 "Junkie" (1953). 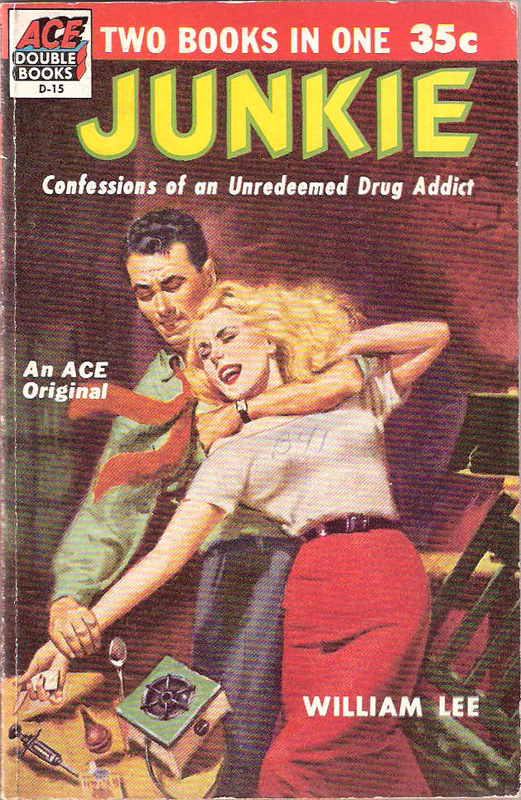 Below is my copy of this killer pulp paperback. The only quibble I'll make is that this is a mass-market paperback, and not a pulp. Isaac Asimov: A brief overview of his pulp writing history. For the record, Asimov made a single appearance for Martin Goodman, contributing the short story "Shah Guido G." in Marvel Science Fiction Vol 3, #5 (Nov/51). Illustrations for this story were by Lee Ames. Pulp Artists: A discussion about the importance of the painted cover in drawing in a reader browsing the newsstands. Mentioned are N.C. Wyeth, Milton Luros, Margaret Brundage, Hannes Bok and Norman Saunders. Brundage was world renowned for her Weird Tales covers. Bok was equally renowned for his science fiction artwork and contributed the covers to Goodman's Marvel Science Fiction Vol 3, #4 (Aug/51) and Vol 3, #5 (Nov/51), as well as contributing illustrations to Vol 3, #5 also. Norman Saunders: Norman Saunders gets the bulk of this exhibit. 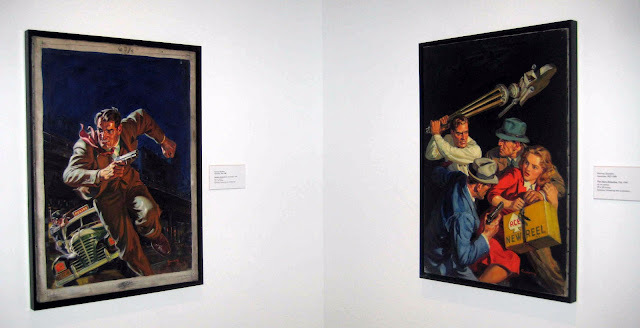 A brief history is depicted and then hanging in the gallery are at least 7 original paintings by the pulp master, all I believe belonging to the Syracuse University Art Collection and from Street and Smith pulps. Saunders' Martin Goodman career will be covered in detail in my upcoming book. Pulp Readers: A brief discussion about the audience for these publications and their cultural context. And finally, "The Pulp - A Reminiscence by a Reader & Collector", a two-page pulp labor-of-love by Gary Shaheen, whom I believe loaned material for the show. Gary is a senior vice-president at Syracuse University's Burton Blatt Institute and a passionate pulp collector and historian. Together with Sean Quimby (Director of Special Collections) and even pulp historian David Saunders (Norman's son, who lent his expertise and permission to reproduce his father's work), a wonderful exhibit was produced. The first photo below is Lubin House from across the street on 61's street. The second is a close-up of the exhibit advertisement hanging outside. As you enter the room upstairs, on the immediate right was a wall display of assorted pulp titles in all genres. (Sorry about the flash glare in the middle). Important to us here is a single Goodman Red Circle pulp in the third row (and the only one in the entire exhibit) American Sky Devils Vol 1, #4 (Jan/43). This was a 6-issue war-era pulp, a title that ran through the heart of World War Two. Nearly all of the stories supported as propaganda the United States air war against their Japanese war enemies. Authors included David C. Cooke ("The Stop-Watch Pilot") who also wrote for Lloyd Jacquet's Funnies Inc. shop and contributed numerous text stories to early Timely comics put together in that shop. Complete Sports Vol 6, #5 (Apr/49) "The Home Run That Wasn't"
Complete Sports Vol 7, #1 (Oct/49) "Grudge Fight"
Western Short Stories Vol 6, #8 (Sept/49) "The Last Deal"
Marvel Mystery Comics #2 (Dec/39) "Death-Bird Squadron"
Marvel Mystery Comics #3 (Jan/40) "Siegfried Suicide"
Marvel Mystery Comics #4 (Feb/40) "Warning Enough"
Marvel Mystery Comics #7 (May/40) "Blasting Bombers"
Marvel Mystery Comics #15 (Jan/41) "Dreadnaught from Mars"
I also recently came across an advice article he wrote for prospective authors in the Feb/49 issue of the trade magazine Author & Journalist. 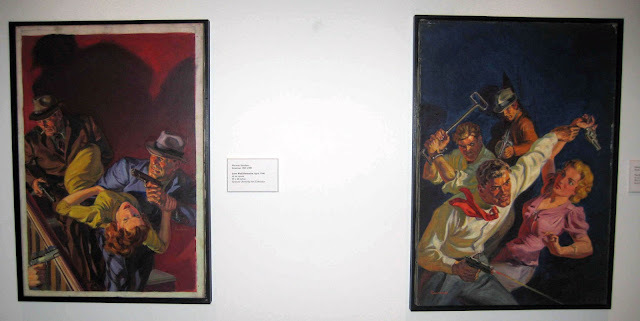 The piece, entitled "Rejections Are Your Own Fault", is a critique of the majority of the writers sending in submissions to the pulps and magazines of the day. Cooke is basically giving us Sturgeon's Law, that 90% of everything submitted is garbage and it takes a lot of work for an editor to wade through piles of garbage to locate something that can be printed. Cooke's commentary is based on his position as editor at Whisper magazine. Sorry about the quality of the image below. 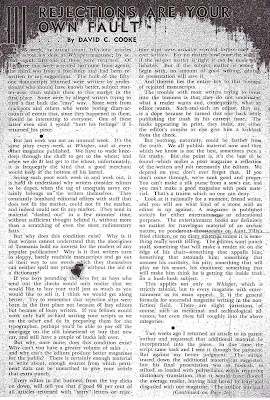 It's a photocopy of a microfilm image. This particular cover was painted by Norman Saunders, who also painted the covers to issues #1 and #2. Allen Anderson painted #3. The interior pulp illustrations were frequently handled by Timely comics staffers and included artists Stan Drake, George Klein and David Gantz, as well as non-Timely illustrators like J.W. James, Harper and H.W. Kiemle. 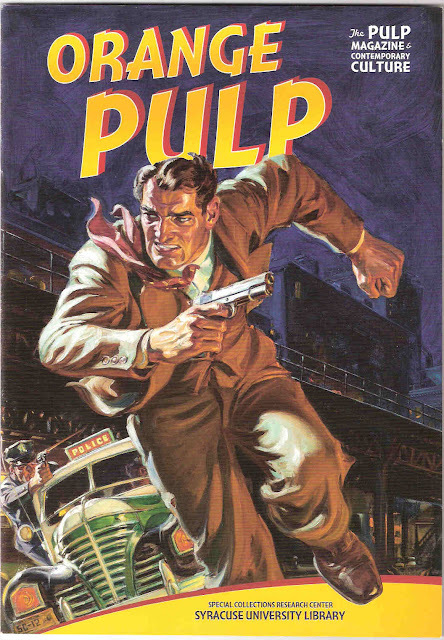 Below is my copy of the pulp. 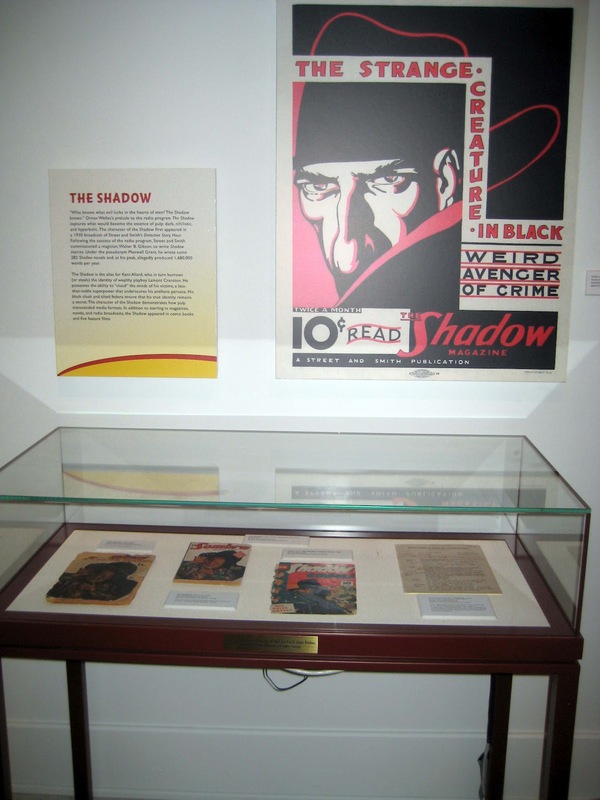 As we continue left we come across an exhibit on The Shadow, Street and Smith's most iconic pulp hero. The display had a component running audio from the radio show on a loop. Continuing to the left we see a trifecta of gorgeous Street and Smith original paintings by Norman Saunders. The illustration at the top right above is an original illustration by August Schomburg, an older brother of noted science fiction and Timely Comic cover artist Alex Schomburg. Alex's Martin Goodman career will be covered in detail in my book. 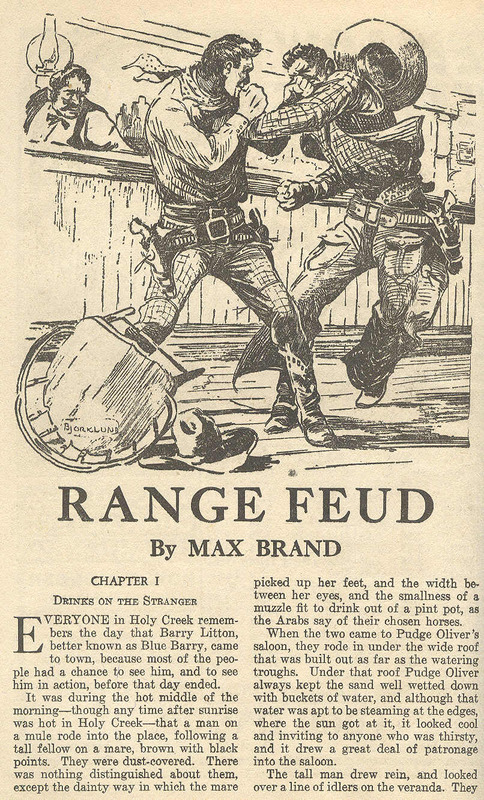 The image at the lower right bottom above is an original pen and ink illustration by L.F. Bjorklund, the most prolific western interior pulp illustrator that Martin Goodman employed. His riveting images can be found in nearly every western and adventure Red Circle pulp published throughout the decade of the 1930's, including all the illustrations utilized in all three issues of the Red Circle's Ka-Zar. I apologize for not getting a better picture of this illustration. Here's one below. Doesn't this look like it's more fun than M.O.M.A or the Met, Michelle? All photographs were taken by myself at the Orange Pulp exhibit at Syracuse University's Palitz Gallery at Lubin Hall on April 12, 2012. Images of Ace's D-15 "Junkie" by William Burroughs, American Sky Devils Vol 1, #3 and L.F. Bjorklund's illustration in Best Western #1 (Sept/35) were taken from my own collection. Special thanks is given to Katie Hudson '10 (Syracuse University), who was able to locate for me the very last copy of the exhibit's program book. All had been given out by the time I saw the show on the last day and Katie went out of her way to find me a copy!